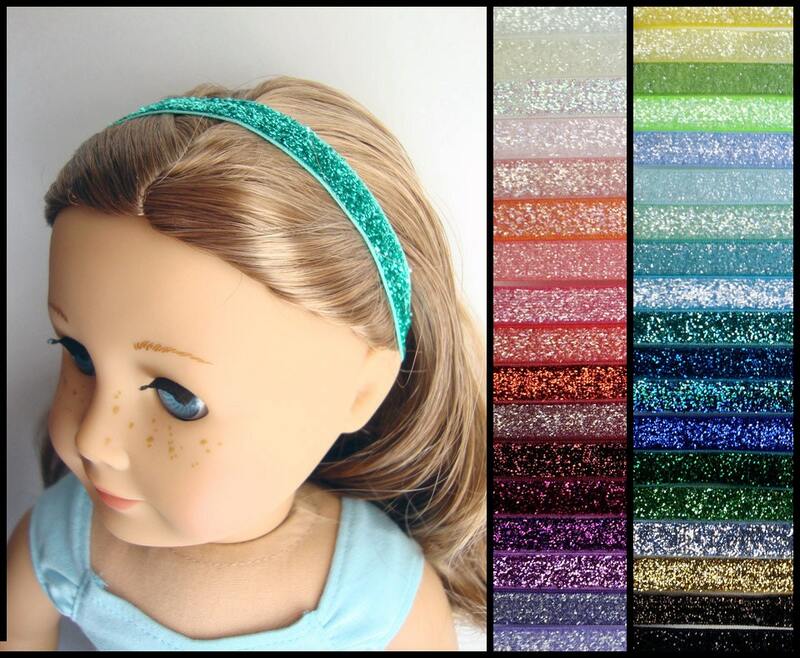 Add the perfect finishing touch to your doll's outfit with these fun glitter elastic headbands. Each headband is 3/8" wide and perfectly sized for your doll. Fits American Girl, Bitty Baby, and Bitty Twin dolls. All headbands are made of elastic materials and stretch over the doll's head. These are SEWN and not glued, and will hold up to repeated stretching. All headbands are made upon order and take 3-5 days for processing before shipping. Listing is for ONE headband--please pick your color! These should also fit Blythe, Pullip, Hearts for Hearts, and other dolls with similar 10" head circumference. May also fit slightly larger dolls as well, as the headbands do have quite a bit of stretch. They will not, however, fit children or adults. Lizziebee Designs is a one-woman studio specializing in handcrafted, quality clothing and accessories for American Girl, Springfield, Madam Alexander, Our Generation, and other 18" soft-body dolls. All of out items are handmade with the best materials and notions in a smoke-free home. All of our fabric is pre-washed when possible and all seams are finished to provide extra protection against wear and tear. We offer a 100% guarantee--if you're not happy with your purchase for any reason, PLEASE let me know and I'll work with you to make things right!